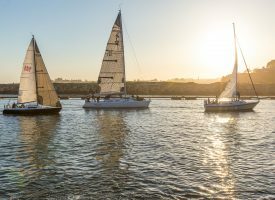 Located between Monterey Harbor and Pillar Point Harbor of Half Moon Bay, Santa Cruz Harbor offers premiere guest berthing to visiting boaters. While staying on one of the harbor’s end-ties, you can enjoy convenient access to numerous beaches and restaurants, downtown Santa Cruz, Capitola, and the Santa Cruz Beach Boardwalk. Guest berthing is on a first-come, first-served basis; reservations are not accepted. The harbor office will assign all end-ties and other designated dock spaces to visiting boaters. Prior to entering the harbor, visitors are encouraged to radio the harbor office on radio channel 9 for an end-tie assignment. Visitors must come to the harbor office for initial registration. Vessel registration (CF number or documentation number) is required when registering. Visitors are charged on a nightly basis. Guest berthing is permitted for up to two weeks, though extensions may be granted with harbormaster approval. Please consult the current entrance sounding and check the most recent weather and tide conditions prior to transiting the harbor entrance channel. Checkout – Checkout time is at 12 noon on the day of departure. There is a two week maximum stay. Rafting Policy – Boaters must agree to allow other vessels to raft alongside on docks. Rafting is kept to a minimum, if possible. Keys – Gate/restroom keys can be obtained for a $40 refundable deposit. Shower fobs can be purchased for $10. Shower fobs are non-refundable but can be reactivated for future use. Dockside Electricity & Water – Electricity (110 volts, 20 / 30 amps, and fresh water are available at each slip assignment. Sewage Disposal – Pump-a-head facilities are available at the fuel pier. Parking – Visitor berthers are offered one parking pass for their vehicle and one parking pass for their trailer, if needed, during the time of their stay. Insurance – Vessel insurance is requested, but not required, for short-term berthing privileges. Owners of visiting vessels requesting berthing beyond a two-week maximum may be required to provide proof of insurance as a condition of the extension, which requires Harbormaster approval.